Drinks and Bad (awesome!) Sets! Their team name is funny but it undersells this teams abilities! 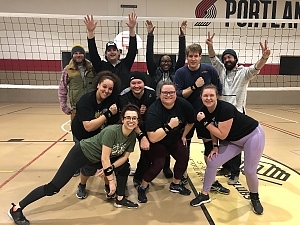 Seeded as third in their league, Drinks and Bad Sets were ready to work their way up and take home the title, a sponsor bar coupon, a fancy champs wrist band and of course... bragging rights!! They weren't blowing anyone out of the water but that was their best strategy. They played a slow and steady game, worrying about one point at a time. Not letting the other team get to them, they played smart. They walked on to the court with a 7-2 standing. Those two losses were to teams that they would be playing in their semifinals and finals but they didn't let history repeat itself! The final scores in the last few sets were close but sure enough they took home the title! Congrats on being our champs! Bad and Boozie takes the title! 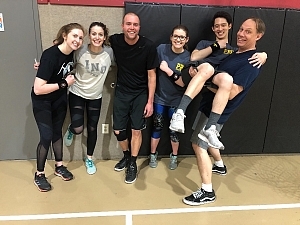 Bad and Boozie fought their way through the entire season without ever letting up on the intensity and they came out on top! This Indy team hit the ground running. They may be new friends but from the way they all play together and compliment each others skill sets, a bystander would never know that they were new to playing with each other! They walked into the playoffs with a 7-1 standing and funny enough the one team that they had lost to this entire season was the team that they would be playing in the final showdown for the champs title! But they didn't let that get in their way! This team really came together, talked it up, got scrappy, and put in the work! And in the end it paid off! Congrats on being the midcore champs!